Why is Slow Rolling Frowned Upon on Poker? If you watch poker on TV or play poker in any capacity, you have likely come upon a situation where somebody has been intentionally slow-rolled, or maybe it has even happened to you. With a slow roll, a player with an unbeatable hand takes their time showing their cards when it's time to show. They will act as if they have the losing hand, only to turn over the winner. For instance - let's say that a villain has pocket Aces and the flop comes A-A-3. After calling post-flop and turn bets, the villain pushes all-in on the river, only to be called by his opponent. His opponent flips over pocket Threes for a full house, while the villain scratches his head, looks around and laughs before turning over his winner. So why is slow rolling considered to be poor form? Poker is a game of craftiness and trickery, though there are still basic rules of etiquette that all players are expected to abide by. When the hand is over, there is no need to further antagonize your opponent. If you have the best hand, simply turn it over and take down the pot. Slow rolling goes against the concept that poker is a "gentleman's game" and that a player should conduct themselves accordingly. 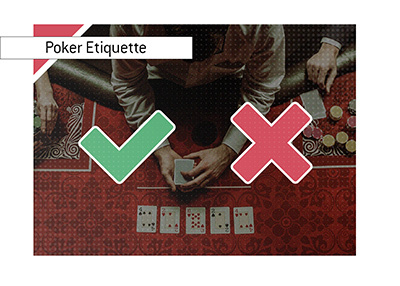 While slow rolling is not cheating and does not violate any rules of the game, it is considered to be very poor etiquette. Slow rolling will get you disinvited to poker games in quick order, or even worse - you might find yourself on the wrong end of a very angry player at your table.